Villages At Emerald Bay Emerald Bay Condos: This coastal contemporary North Naples condo looks right off the page of a Luxury Home Design magazine. One of the FINEST units EVER offered in the community, this spacious 3-bed, 1-car garage, 1490 sq ft home was COMPLETELY renovated in 2018 with finishes akin to a million-dollar home. The re-designed open concept kitchen with brand new crisp white cabinetry, mosaic backsplash & all stainless-steel professional-grade appliances is an entertainer’s dream. From the whole-house white granite counters, luxury driftwood vinyl plank floors with lifetime warranty & brand-new $6K plush luxury carpeting, to the spa-like renovations of both bathrooms, to the new 2016 A/C unit, impact windows/shutters, new $5K cable rail banister, all new lighting fixtures & fans, new neutral paint & wallpaper, this home is 100% move-in-ready. Sold turnkey with stylish contemporary furnishings & décor. Excellent location in the Villages at Emerald Bay, West of 41 & a short bike ride to Vanderbilt Beach, Barefoot Beach & dining/events at Mercato. This gated community has new 2014 tile roofs, state-of-the-art fiber-optic internet/cable in 2016, 2 pools, tennis & HOA fees include EVERYTHING except for electric! Villages At Emerald Bay Emerald Bay Condos: Minutes from some of the best beaches in Southwest Florida! Come home to this bright and inviting 3-bedroom, 2-bathroom carriage home in the friendly community of Emerald Bay. This furnished unit features a large lanai made for entertaining and a sun-drenched living room. Emerald Bay features two swimming pools, a clubhouse, and plenty of activities to keep you and your guests entertained and active. What are you waiting for? Pack your bags and come home to paradise today! Villages At Emerald Bay Emerald Bay Condos: Imagine a West of 41 location in a well-run gated community at an affordable price. This attached villa home will speak to buyers looking for the ease of condo living but the feel of a single-family home right down to the backyard. Bike to two of the country’s top beaches or enjoy one of the pools/spas in this truly welcoming community. This coveted Egret 3/2 floor plan with no one above you, has an open entry courtyard area as well as a rear screened lanai and a beautiful flow with great separation of space between guest bedrooms and master. Wholly private rear lanai offers 3 access points via the Master, living and kitchen. Everything included in your fees from water consumption to hi-speed wi-fi internet, condo fee includes everything except electric!! In the last 4-5 years this community has installed new barrel tile roofs, fiber-optic cable, resealed parking lots and roadway, installed new post boxes, painted all buildings, updated the clubhouse, rear pool screened lanai area, both pool restrooms, extensive landscaping and soon to add new lighting throughout the community and a new entry sign. Villages At Emerald Bay Emerald Bay Condos: Leafy green shade and a stunning long lake view! Palms and pines frame the view from this lovely large 3 bedroom in Emerald Bay! Enter to an open, vaulted ceilinged great room with views straight out to the lanai and the lake. This turnkey condo is large enough for a full size breakfast nook and a dining room. The kitchen anchors both spaces and has been renovated with granite countertops, new cabinet doors and hardware and a travertine and glass backsplash. Appliances are Samsung, Whirlpool and Kenmore with ample cabinet storage and a pantry. There are 2 vacation chic beachy bedrooms that share a renovated bathroom with new tile and granite counters. The master overlooks the lake and features a large double sink vanity and soaking tub shower combination with a rainhead. There is also a large walk-in closet. Emerald Bay replaced all roofs in 2016 and is in the process of refurbishing their clubhouse. The community features 2 pools, tennis, pickle ball and fiberoptic. The location is stellar and is located just off Vanderbilt Beach Road, near to Wiggins Pass Park. The new Lucky’s supermarket will be a 2 minute drive when complete. This home is move-in ready and very pretty. Villages At Emerald Bay Emerald Bay Condos: GREAT LOCATION...Off of Vanderbilt Drive! Close to Barefoot Beach, Wiggins State Park, Golf, Shopping and Fine Dining...This little Gem is located in The Villages of Emerald Bay! Vaulted Ceilings and Floor Plan makes this 2 Bedroom Unit Spacious and allows for Great Entertaining...This End Unit is surrounded by Mature Vegetation and the back Western Exposure overlooks a Wooded Preserve...The Community continues with Several Improvements including New Roofs, Painting, Landscaping and the Renovation of The Clubhouse!! Don't let this one get away from you!! Villages At Emerald Bay Emerald Bay Condos: Your ticket to Paradise! This 1200 sq ft. lower 2 bed, 2 bath lakefront condo with updates is in the sought after Villages of Emerald Bay gated community & is now available. The updates include granite counters, custom backsplash, bedroom flooring, paint, window treatments and water heater. The bedrooms are split, the great room is ample and the lanai is the best place to unwind after a busy day. The community is vibrant with plenty of activities including; tennis, pickle ball and swimming exercise classes- event happenings are posted in the newly updated club house overlooking 1 of 2 pools and the lakes. The exteriors have been painted and roofs replaced, all you need to do is set up a showing! This North Naples area condo is truly a gem- close to several beaches; including Barefoot Beach. 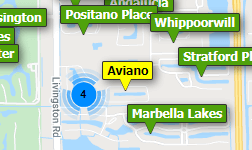 West of 41, low HOA fees, minutes to some of the best shopping and dining Naples has to offer. You won't be disappointed at the value this condo provides. Need professional assistance selling your property at Emerald Bay Naples? Find out how an Area Specialist can help to generate more property exposure in order to get the most money for your investment in the least amount of time.